From left: Volleyball player Abby Sherman, head women's lacrosse coach Katie Russo, head women's volleyball coach Carrie Bert and volleyball player Hannah Johnson take a break from Wednesday's volunteer efforts at Ten Thousand Villages in Harrisonburg. From April 1-6, Eastern Mennonite University athletes and coaches celebrated NCAA DIII Week with a series of events and service projects around the university's core values of peacemaking, sustainability, service and community. EMU student-athletes celebrated Division III Week, an annual nationwide week of recognition designated by the NCAA, April 1-6, with activities focused around the university’s core values of peacemaking, sustainability, service and community. “This year, we decided to focus on the ways that athletics help EMU fulfill its mission and their many contributions to our community,” said Director of Athletics Dave King. A panel on peacemaking and intercollegiate athletics featured women’s volleyball coach Carrie Bert, men’s soccer coach Roger Mast, senior volleyball player Maria Yoder, and senior basketball player Josh Good. Check out senior basketball player Jourdyn Friend joining other ODAC athletes to promote good sportmanship in this ODAC-sponsored DIII Week video. King moderated a second evening discussion on the topic of sustainability and intercollegiate athletics. 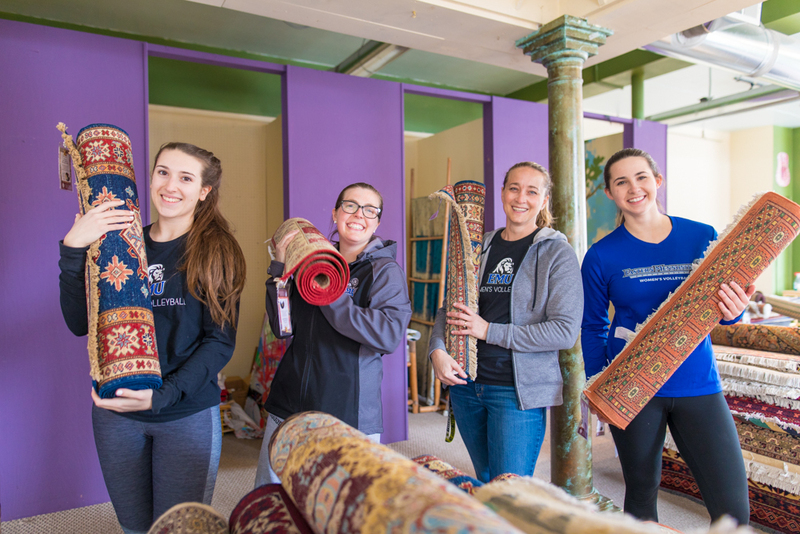 Athletes volunteered to help move rugs for a Ten Thousand Villages sales event. Women’s lacrosse coach Katie Russo said the time also involved some learning about the rugs themselves, “beautiful creations that can take up to two years for Pakistani rug artisans to develop.” Ten Thousand Villages is a nonprofit organization specializing in fairly traded goods from around the world. Fellowship of Christian Athletes hosted their weekly huddle on Thursday evening. The leaders include Bailey Hall (baseball), Laurie Serrell (track and cross country), Brittany Viands (softball), Megan Breidigan (soccer), Austin Sachs (golf), Lindsey Krisak (basketball), Justin Odom (track and field), and assistant baseball coach Adam Posey. Among the notable athletic events scheduled during the week, EMU softball hosted a StrikeOut Cancer doubleheader, splitting with crosstown rival Bridgewater. On Saturday, the track and field team hosted the first home meet since 2008 and the baseball team played in a doubleheader against nationally-ranked Randolph-Macon.